It makes absolutely no sense. Why would anyone in their right mind purchase a cupcake when they are on their way to help bake and decorate 3 dozen cupcakes? Well, ladies and gentleman, I might be a little (or a lot) cupcake crazy. A couple weeks ago my sisters asked me to pick up very special birthday cookies for my niece’s first birthday party from Snickerdoodles Bakery in Hampstead, MD. I debated for about half a second before deciding I was buying this cupcake and sharing it with my sisters, even though we would be baking rows upon rows of cupcakes. Luckily my sisters know me pretty well and they were not shocked at all that I arrived with a cupcake. After getting most of the food and baking done for the party we decided it was time to divide this massive cupcake up between us. In addition to the peanut butter frosting there was a gooey peanut butter filling. I’ve never seen this in a Peanut Butter Chocolate cupcake before and couldn’t wait to dive into my piece! As expected, it was moist, rich, and sweet. Snickerdoodles Bakery has some seriously amazing cupcakes. They might be a bit out of the way for some (like me), but are definitely worth a visit. 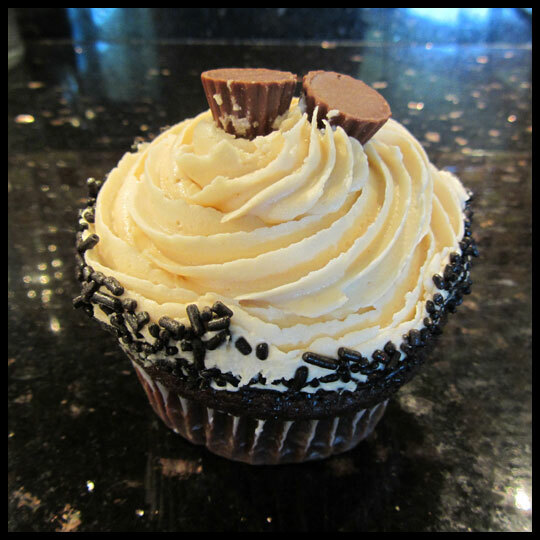 This entry was posted in Cupcakes, Maryland and tagged Hampstead, peanut butter, peanut butter chocolate, Peanut Butter cup, Snickerdoodles bakery by Stacy. Bookmark the permalink.